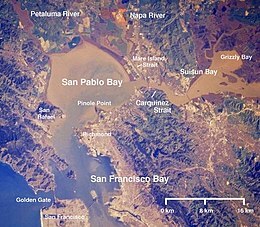 San Pablo Bay with Suisun Bay at upper right. Suisun Bay (/səˈsuːn/ sə-SOON) is a shallow tidal estuary (a northeastern extension of the San Francisco Bay) in northern California. It lies at the confluence of the Sacramento and San Joaquin Rivers, forming the entrance to the Sacramento–San Joaquin River Delta, an inverted river delta. Suisun Marsh, the tidal marsh land to the north, is the largest marsh in California. Grizzly Bay forms a northern extension of Suisun Bay. The bay is directly north of Contra Costa County. Aerial photo of the Suisun Bay. Benicia to the left, Martinez to the right. The bay was named in 1811, after the Suisunes, a Native American tribe of the area. The word originates with the Patwin. On the west, Suisun Bay is drained by the Carquinez Strait, which connects to San Pablo Bay, a northern extension of San Francisco Bay. In addition to the major bridges at the Carquinez Strait, it is spanned in its center by the Benicia-Martinez Bridge and at its eastern end by the State Route 160 crossing (Antioch Bridge) between Antioch and Oakley. It is the anchorage of the Suisun Bay Reserve Fleet, a collection of U.S. Navy and merchant reserve ships, which was created in the period following World War II. The Glomar Explorer was anchored here after recovering parts of a sunken Soviet submarine in the mid-1970s (see Project Azorian). Many ships were removed and sold for scrap in the 1990s. In 2010, plans were announced to remove the mothball fleet in stages, with final removal by 2017. The Central Pacific Railroad built a train ferry that operated between Benicia and Port Costa, California from 1879 to 1930. The ferry boats Solano and Contra Costa were removed from service when the nearby Martinez railroad bridge was completed in 1930. From 1913 until 1954 the Sacramento Northern Railway, an electrified interurban line, crossed Suisun Bay with the Ramon, a distillate-powered train ferry. On April 28, 2004, a petroleum pipeline operated by Kinder Morgan Energy Partners ruptured, initially reported as spilling 1,500 barrels (264m³) of diesel fuel in the marshes, but, this was later updated to about 2,950 barrels. Kinder Morgan pleaded guilty to operating a corroded pipeline (and cited for failing to notify authorities quickly after the spill was discovered) and paid three million dollars in penalties and restitution. The battleship USS Iowa and "Ghost Fleet" in Suisun Bay (Iowa has since moved to the Port of Los Angeles as a museum ship). Another view of the "Ghost Fleet", also known as the "Moth Ball Fleet". ^ "Suisun Bay". Geographic Names Information System. United States Geological Survey. ^ "Google Maps". Google Maps. Retrieved June 28, 2018. ^ "Assault on America: A Decade of Petroleum Company Disaster, Pollution, and Profit". NWF. 2010. ^ Mike Taugher (August 18, 2010). "Oil spill fine goes to restore Suisun Marsh wetlands". Times-Herald. Retrieved June 28, 2018. Carl Nolte (April 1, 2010). "Suisun Bay's ghost fleet may finally R.I.P." SF Gate.